SPRING AND SUMMER DATES STILL OPEN. ENJOY THE BEACH AND WARM SUNSHINE!! If you have any questions, please click on the Ask Owner A Question button, and I would be happy to email a response for any questions you may have. BOOK NOW TO SECURE YOUR FRONT ROW SEAT ON THE BEACH!! This Condominium is a DELUXE 5th floor Direct Ocean Front unit with views of the ocean from the Private Balcony and the Master Bedroom. This spacious condominium was recently remodeled and has two bedrooms, two bathrooms, and full kitchen with all the amenities. New Cabinets, Granite, Recessed Lighting in Kitchen. For your convenience and enjoyment, All New Kitchen Appliances, (May, 2016). New Samsung-High-Efficiency-Top-Load-Washer-November, 2016 and New Maytag Dryer. New Balcony Bar-Height Table and Chairs for Viewing Beautiful Beach While Having your Morning Cup of Coffee or Cocktail In The Evening Enjoying The Beautiful View and Breezes!! New Serta Sleep To Go 12 Inch Gel Memory Foam Luxury King Mattress in Master Bedroom, February, 2018. One Queen And One Twin In Second Bedroom. New Bedding to Include New Comforters. This 2/bedroom-2/bath unit has direct oceanfront views from Balcony. This complex has Private Lighted Tennis Courts. The Pool is heated to a beautiful and refreshing 85 degrees) as well as a Jacuzzi (104 degrees). This Direct Ocean Front exposure gives you warm sun all morning from the privacy of your Beach Balcony. Catch the Sunsets from the front balcony over the inter-coastal. 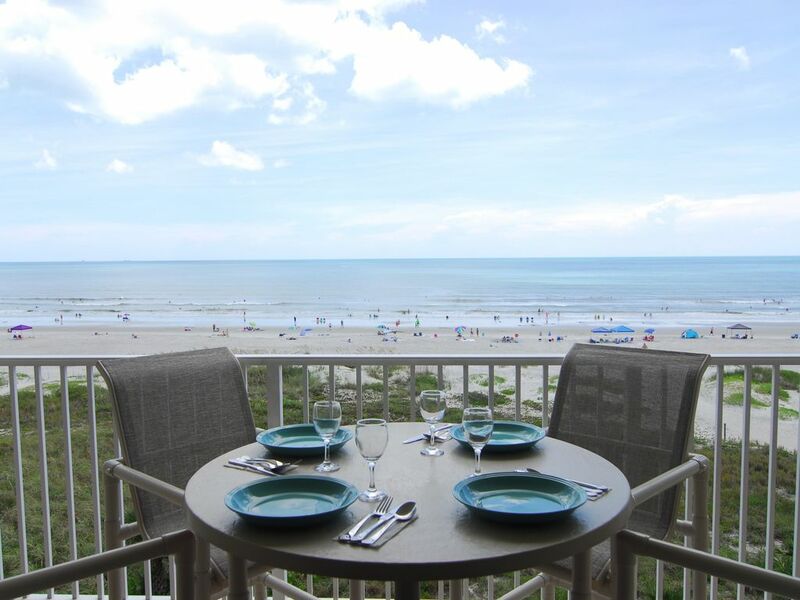 This oceanfront complex is located in Cocoa Beach about an hour east of Orlando, Disney World & the Airport. That's right, about an hour away from Orlando's major attractions including Disney World, Universal Studios, Epcot Center, Sea World, MGM Studios, and Animal Kingdom. Less than one hour from Orlando International Airport and Disney World. Minutes from Kennedy Space Center, the cruise ship terminals and you are in the heart of Cocoa Beach. You simply will not believe the beautiful view and sun rises. Watch the Dolphins and Cruise Ships From The Privacy Of Your Own Balcony. Unique open floor plan. 1,300 Square Feet Large. Recently remodeled and freshly painted. Fully furnished with full kitchen, all linens and towels. New Beach Towels. Cable TV in every room; DVD Player. Washer and Dryer in unit. You will have everything you need including beach chairs. New Bedroom Furniture To Include New King Bed And Comforter in Master, one queen and one twin bed in second bedroom with new comforters. Living Room has large Sectional with a pull-out Sofa Sleeper for extra sleeping accommodations. New I Pod Charger/Player. New Glassware. New 48 inch screen tv in living room. 32 inch screen tv in master bedroom and 26 inch screen tv in 2nd bedroom. This is a beautiful unit recently updated with all tile floors, (May, 2016). It has a classic, clean modern design and sweeping ocean views. Balcony has patio table and chairs for views of the ocean, and for reading the paper or sunbathing. Easy walking distance to dining and entertainment. We'll do our best to meet your rental requirements. Popular weeks book well in advance so don't delay! Booking a year ahead isn't unheard of. Complimentary High-Speed Wireless Internet Access, Local and Long Distance, US and Canada Telephone Service Provided. Can Still View a Rocket Launch-Check Kennedy Space Center website for future dates. 2 Bathrooms - Master has Shower, Full Bathroom next to 2nd bedroom has combination tub/shower. Ample Parking. No Extra Fee. All bath towels provided. Beach Towels also Provided. All new Tile throughout condo. Newly Remodeled in May, 2016. New granite counter tops, new cabinets, recessed lighting, new bar-height chairs at wet bar. All New Tile Throughout Condo. New 48 inch flat screen tv in living room. 32 inch screen tv in master bedroom. 26 inch screen tv in second bedroom. Balcony directly faces the Ocean. Absolutely No obstruction. On-Site Private Lighted Tennis Court. Beautiful Golf Courses in and around the Cocoa Beach Area to Choose From. Beautiful Heated Swimming Pool. Heated to 85 in Winter Months. Cocoa Beach Health and Fitness, right across the street from Complex offers discounts to all Guests who stay. Call them for daily/weekly/monthly rates offered. Just call and say you are staying at Sandcastles to get their best rate! Local and Long-Distance Phone Service Including Canada. Air Conditioning, Cable TV, Complimentary High-Speed Internet. DVD player. Full Kitchen, Microwave, /Stove Dishwasher, Refrigerator, Ice Maker, Cooking Utensils provided. Linens,Towels, Beach Chairs, Beach towels provided, Washer & Dryer, Hot Tub (shared), Community Pool. Great stay in Cocoa Beach! The condo exceeded our expectations in every way! It had the perfect amount of space and was clean and comfortable. Everything we needed for a wonderful stay at the beach was there including towels, umbrellas, beach chairs and boogie boards. The location was fantastic and the views even better. Joyce was a responsive and wonderful host and made everything seamless. We will definitely stay here again! Very clean well equipped ocean front condo. Beautiful view of the ocean all day long. We stayed for one week. Would have loved for it to be longer. Have stayed a few other places on Cocoa Beach, this was our favorite.!! Beautiful condo, our favorite so far of the past few years of vacationing in Florida! Perfect location and great beach view. This condo has everything you could need for your beach stay. Kitchen is well stocked. Plenty of beach chairs, boogie boards, beach umbrellas, sand toys, and beach towels. I went to sleep every night listening to the waves. So relaxing!! The owner is super fast at responding to any questions you might have. There are many restaurants within a 10-15 minute walking distance or to drive to. Publix is close by. Mini golf, souvenir shops. Great sunrises! Saw some dolphins swim by and watched a night-time rocket launch from the beach. If we are lucky enough to be able to travel back to Florida, I would look in to renting this condo. Thanks Joyce for our week away from the frozen tundra of northern New York!! Excellent and exceeded our expectations! This condo is everything as advertised and more! Joyce is very personable and responds to inquiries or issues promptly. We would definetely rent this unit again! Best ocean view we’ve had! Property very well maintained. Condo well-equipped and comfortable. Beautiful furniture. Couch comfortable but appears that guests may have had suntan oil on their legs. Being between Kennedy and Patrick AFB was a treat. Cruise ships and tankers always in and out of Port Canaveral. This condo was wonderful and it was equally matched by the manager, Joyce! Joyce was so accommodating and quick to respond. One of the nicest managers I've had the pleasure of working with on a vacation rental. She had great recommendations too. Seeing this place in person is even better than the pictures and those are good pictures! This vacation was a girl's trip and first time in Coco Beach. The condo was so clean and nicely updated with comfortable beds and well equipped kitchen. We spent a lot of time on the balcony overlooking the ocean taking in the morning sunshine and the sound of the waves. We loved the local restaurants such as the Fat Snook, Fat Kahunas, Florida Fresh Grill, Cafe Surfinista and the Grill at the port in Cape Canaveral. Really cool places with great food and vibe! We swam in the saltwater pool (loved that it was not chlorine) and relaxed in the spa, walked the beach. This whole place is well maintained. We also went over to Cocoa Village about 10 miles east. Very quaint streets with cafes, pubs, little shops and a gallery. We loved Pub Americana and the upstairs outdoor deck at Ryans. That was a great trip! Thank you Joyce for a great place to stay and we will be coming back again and again! Local attractions include the Cape Canaveral (Kennedy) Space Center, Rocket Launches, Sterling Casino Cruise Lines, Ron Jon's Surf Shop, Ocean Fishing, and Golfing. Less than an hour north is the Daytona Speedway or continue up the coast to tour Beautiful Saint Augustine. This condominium is only minutes away from the Cocoa Beach Pier and the Boardwalk. Check out the Night Life at 'Coconuts on the Beach', 'Heidi's Jazz Club', 'Cocoa Beach Pier', 'The Beach Shack', or 'The China Beach Lounge'. Rates may be adjusted and may differ depending on the time-frame you inquire about. I can provide Discount for fill-in nights. Per night rates are to fill in my calendar after a weekly rental or if just available. Rates are from $185.00 to $265.00 per night based on time-frame, and may not work for the dates you are looking for. Weekly rates range from $1,000.00 and up. Monthly rates range from $3,800.00 and up, plus 12% Florida tourist tax and a one time cleaning fee of $150.00. I offer Discounts for Filler Nights. Cancellation Policy States No Refund. However, based on an extraordinary circumstance, full or partial refund may be made on an individual basis. Sole discretion for refund, if any, made by Owner based on circumstance. Holiday week rates are higher. A $400.00 refundable security/damage deposit is required for booking. NO PETS. NO SMOKING. Must be 25 years of age to rent condo. Condo accommodates a maximum of 6 Occupants. Rates/ Fees Subject To Change Without Notice.